Last month, we launched a contest from our sponsor, OCD and Doc’s Products Inc., inviting you to share your rehabilitation stories with us. We’ve had some wonderful entries so far, and we’ve decided to start sharing them this week. Entries are still open, so don’t forget to send your story to [email protected] for your chance at a great prize pack from OCD! Photo courtesy of Helen Guidotti. I purchased Stanley just before he turned four in 2012. He is an OTTB and was actually in a race with Animal Kingdom — racing was just not his thing though. 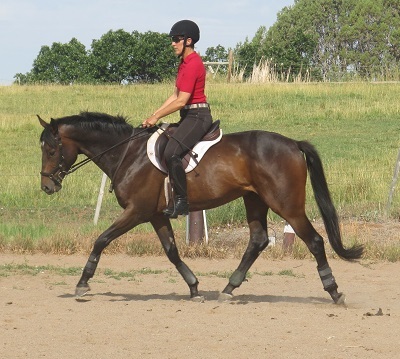 We were jumping, doing dressage and going for rides in the mountains of Colorado to get him used to not being on the track. On August 28, 2013, I was away on a trip, and my friend contacted me to let me know that Stanley had been injured in the pasture. She wasn’t sure he would make it, but the vet was on his way. Stanley had cut his hind leg from the inside of his femur almost up to his stifle, swirling all the way down and around to midway down his cannon bone on the outside of the leg. Yes, I did get to see both bones — what fun. He severed the tendons that run up the front of the cannon bone. 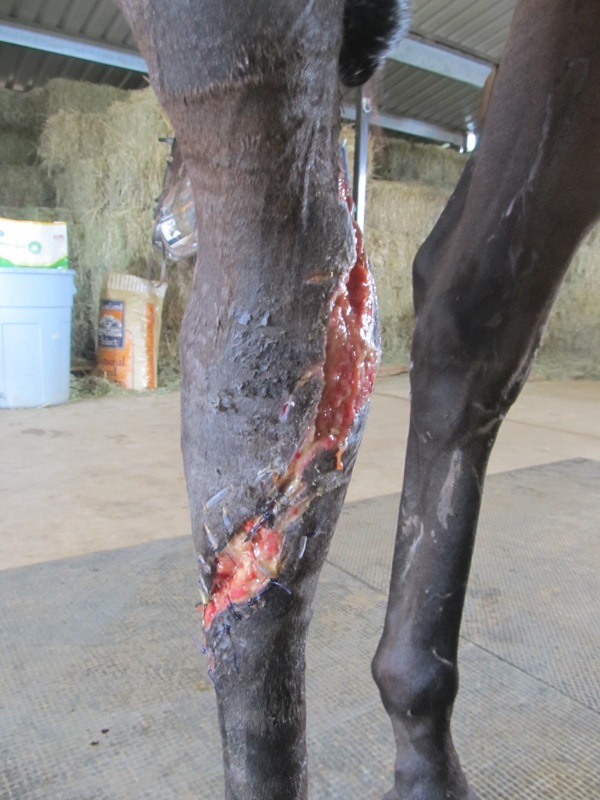 This photo was taken 12 days after the injury (WARNING: Graphic image). After amazing vet care from my vet Dr. Ben Hufnagel, incredible supplements, acupuncture, chiropractic work, very careful rehab and the age old tincture of time, Stanley is coming back. He has made a miraculous recovery. This injury has reshaped my plans for him, as every day I am unsure about his jumping abilities. So far, he has made it to jumping about 18 inches. I did take him to a local dressage show and he performed two lovely tests — I couldn’t be more pleased. Stanley is a very kind, curious, intelligent horse who loves to learn and has been joyously fun for me to work with. I purchase a horse with a certain plan or goal in mind, but as we all know, that rarely comes to fruition in the manner we had originally planned! So instead of climbing the levels of eventing — which I will still try but know that he’s probably limited — I will spend more time in the sand box. He is a lovely mover and is usually very level-headed. Maybe we’ll do some endurance rides. Stanley is my “one,” and I will go where he can. Our names won’t be up in lights or the head banner on Eventing Nation (Editor’s Note: Hey, you made it on the homepage! ), but we will have fun every day we get to play together, and maybe some day we’ll make it to the American Eventing Championships and see what we can do.